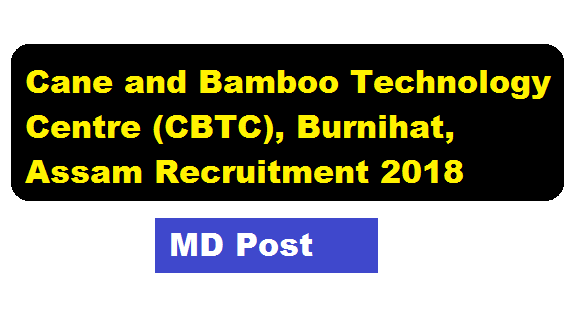 Cane and Bamboo Technology Centre (CBTC), Burnihat, Assam Recruitment 2018 :- According to the latest Cane and Bamboo Technology Centre (CBTC), Burnihat, Assam Recruitment 2018 notification ,Applications are invited from eligible Indian citizens for appointment to the post of Managing Director, Cane and Bamboo Technology Centre (CBTC), Burnihat, Assam. CBTC is a Society registered under the Societies Registration Act 1860 and administered by the North Eastern Council, Min. of DoNER, Govt. of India. CBTC is a designated Bamboo Technology Support Group (BTSG) of the National Bamboo Mission, Min. of Agriculture & Farmers Welfare, Govt. of India. In this section, we will discuss in detail about Recruitment of Managing Director Post under Cane and Bamboo Technology Centre (CBTC), Burnihat, Assam Recruitment 2018 with all the details and requirement. Educational Qualifications: Candidate must be M.Sc. (Agriculture/Horticulture)/ BTech/BE/ MBA degree from an AICTE recognized University. Experience: The applicant should have minimum experience of 15 (fifteen) years of working experience in North Eastern Region in various capacities in the development and livelihood sector. Candidates having working experience in different capacities in different Government departments / organizations will be given preference. matters, estate matters and welfare matters. Salary: Selected candidate will be entitled to get Pay Structure in the pay band of PB-4 Rs.37,400-67,000/- + Grade Pay Rs. 10000/- (pre-revised) corresponding to Level – 14 of the pay matrix under 7th CPC and other admissible allowances. Age: The age of the applicant should not exceed 52 years as on the closing date of receipt of applications. Tenure: The Managing Director shall be appointed on contractual basis for a period of 5 years extendable for a further period depending upon performance. The applications complete in all respects should reach the office of the undersigned addressed to Secretary, North Eastern Council & Chairman, CBTC, North Eastern Council Secretariat, Government of India, Nongrim Hills, Shillong–793003 (Meghalaya) within 20 (twenty) days from the date of publication[18/07/2018] of this advertisement. The details and prescribed proforma for curriculum vitae required to be submitted with the application for the post of Managing Director are enclosed and available in this detailed advertisement placed and hosted in the websites www.cbtc.org.in and www.necouncil.gov.in.